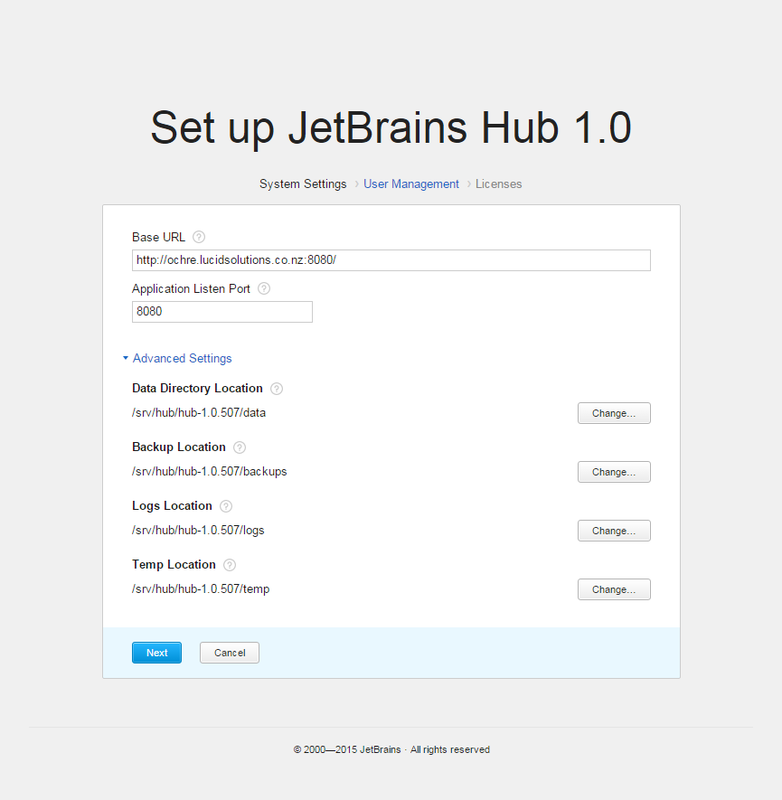 This documents installing JetBrains Hub v1.0 on a CentOS v7.1 VM. The VM has a Nginx reverse proxy in front of it to provide TLS offload and certificate management. The Hub server doesn't have any pre-requisites other than a JVM. It doesn't seem to need a database server. Create a Hub user account. The server will run as this identity. This installation puts the 'hub' home directory on the 'srv' filesystem which has sufficient disk space. Extract the Hub distribution archive into the hub user directory (as the hub user - not as root) into a directory with a version number. Symlink a fixed name to point to this versioned directory. This will allow upgrades to be done easily in the future, as well as meeting the requirement of absolute paths for the systemd configuration. These commands are done as the 'hub' user in the hub home directory ('/srv/hub'). Use the configuration below to create a reverse proxy in front of the service. This handles the TLS/SSL offload. This will connect to the hub service on port 8080. It will provide access to the service with the URL https://hub.lucidsolutions.co.nz.